And wow, was I glad I did. Imagine a stack of six half-slices of french toast generously layered with chocolate sauce and topped with a thick coconut sauce full of coconut flakes, a bit of whipped cream, and a shower of sliced almonds. That's what you get for your $6.25. If candy french toast is not your thing, there are all kinds of other french toast options--like peanut butter and banana, peanut butter and jelly, and coconut cream. Sure there's a full menu with all of the things you'd expect to see at a diner, but french toast, waffles and pancakes seem to be the focus here. Waffle selections ($7.25) include kiwi and cream, caramel pecan, or the "Dolly Parton" (two scoops of ice cream). Pancakes come in corn, pumpkin, oatmeal, buckwheat, or sweet potato ($6.50, short stack $5.50). â€¨â€¨Mike's is bright and cozy; the place was completely full on a Tuesday lunch hour. The map is incorrect. Mike's Diner is located at the intersection of Old State Road and Carman Road, about a mile from Western Avenue. Oh my god, my teeth started to rot just READING about this French toast. And the PB&J option? Genius. It's in Guilderland, not Schenectady. It just has a Schenectady mailing address. Sorry, folks--the American sweet tooth is appalling and adolescent. A side of Gummi Bears and a pitcher of Pepsi would round this out nicely. Enjoy your steamed vegetables and filtered water. Chrisck, now I'm curious. What satisfies the mature sweet tooth? Ohhh man, that looks good! This is just one of the many times I curse my allergies! If your body allows you such pleasure, please enjoy for me! @KiMelodic - I feel you on the allergies. Most of the time I don't have sweet tooth - I have brine tooth. Give me lots of cured olives, sauerkraut and pickles and I'm a happy camper. We've been going to Mike's for years. They have the BEST bearclaws. And cocoa French toast. Oy. Now I can never have lunch there again because I will eat myself out of the good graces of St. Jude. He told me I had to work with him a little. mike's diner is an awful place. bland bland bland bland bland bland blah blah blah no creativity whatsoever. i don't think of a place i would be less enthusiastic about eating breakfast - even in guilderland. nah i think mc'd is a better value - no joke. 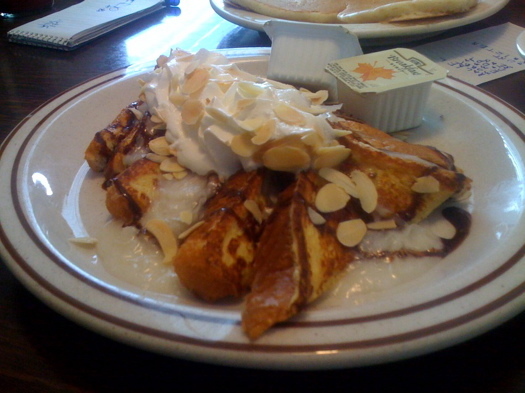 Tried the Almond French Toast yesterday, a few of my teeth exploded it was so sweet. No, honestly, it was pretty good. My friend K had the pancakes, and I'm afraid they were average, definitely not as good as, say, Miss Albany or Cafe Madison. But fast service! ya....and even cafe madison does not use the good blueberries. ive learned my lesson - im going to stick to making pancakes at home. They have fantastic breakfast there. I like the waffles with 3 kinds of fruit. @Keith: it is weird that they have a Schenectady mailing address. My mother in law lives right down the road and she has the same deal. Mike's Diner now has an ATM and takes credit cards..